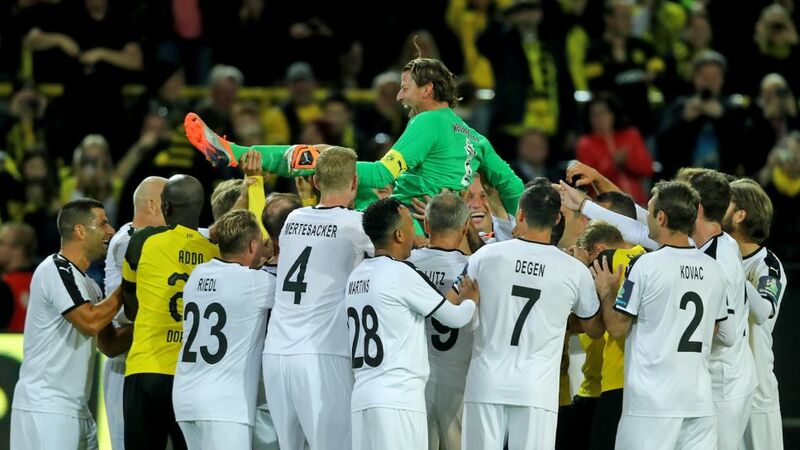 With Liverpool boss Jürgen Klopp in the dugout, retired goalkeeper Roman Weidenfeller was the star of the show in his testimonial match at Borussia Dortmund's Signal Iduna Park on Friday, scoring twice and saving two penalties. Weidenfeller, 37, called time on his career at the end of the 2017/18 campaign after making 349 Bundesliga appearances for the club across a 16-year span, seven of which intersected with Klopp's tenure at BVB between 2008 and 2015. Together, they won two Bundesliga titles, the DFB Cup and reached the final of the UEFA Champions League in 2013, before being reunited one last time in front of a near-sell-out Dortmund crowd. Weidenfeller was beaten by Alex Frei and Mo Zidan whilst keeping goal for Roman and Friends in an entertaining first half, but still came up with some big stops to keep the Dortmund All-Stars from extending their lead. Lukas Podolski had temporarily brought Roman and Friends level prior to Zidan's pearler, and had the chance to do so once more in the second half. Only this time, he was facing Weidenfeller - now playing with the Yellow Wall behind him - for the Dortmund All-Stars. Weidenfeller saved the former Germany international's penalty in what turned out to be quite the second-half salvo from the 2014 FIFA World Cup winner. Willed on by the partisan home crowd, he capped an ambitious run with a finely taken goal, before denying Günter Schmitz from the penalty spot. A good night got even better in the dying embers as the BVB legend dispatched a spot-kick of his own to complete a fun-filled 4-1 win for the men in black and yellow. Weidenfeller is only the eighth Dortmund player in history to be granted a testimonialWeidenfeller made 348 appearances for Dortmund between 2002 and 2018, winning two Bundesliga titles, two DFB Cups and two DFL Supercups.The custodian was also a World Cup winner with Germany in 2014.Weidenfeller's career started with Kaiserslautern in 2000; he spent two years with the Red Devils and the rest of his career with Dortmund.Klopp coached Dortmund between 2008 and 2015, winning the Bundesliga in 2011 and 2012, the DFB Cup in 2012 and leading them to the final of the UEFA Champions League in 2013.Klopp reached his second Champions League final as a coach in 2018, losing to Real Madrid with Liverpool.